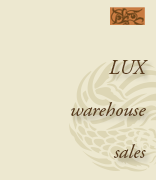 Lux Estates conducts sales in our Emeryville warehouse every few months. Many clients want to dispose of property without conducting a sale at their own location. Sometimes a condominium complex or a gated community will not allow estate sales. Sometimes the timeline is too tight, or parking or access to the property is too difficult. In such cases, we are able to offer your better furniture and antiques, collectibles, silver, jewelry, art, and other items of special interest at our regular warehouse sales. Our warehouse sales are marketed in a similar fashion to an estate sale - through our mailing list, our blog, online advertising, print media advertising, and excellent signage. With items from numerous sources combined in each warehouse sale, we are able to generate a high level of interest and attendance. Our Park Avenue location in Emeryville is fully accessible. Parking is wide open on weekends. The warehouse is spacious and well lit. The area is safe and the warehouse has 24 hour video surveillance and other modern security features.